AFC Fylde boss Dave Challinor praised his players after watching them down high-flying Solihull Moors on Saturday. After a goalless first half, Danny Rowe gave the Coasters the lead, only for Jamey Osborne to get the home side back on level terms. 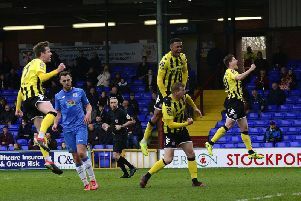 However, Rowe’s second of the afternoon was enough to give Challinor’s players a 2-1 win as they sit fourth in the table, four points behind leaders Leyton Orient. “Obviously a good win, in a game that I think we started well,” Challinor said afterwards. “But then I think we didn’t play to our strengths, and we were probably fortunate to be level at half-time. “We started the second half well, certainly much more positively, and we backed ourselves which showed as we got the goal. “I’m disappointed with the goal that we conceded but I think we got the foothold after that. “We knew we’d have to defend the penalty area against Solihull and the way they play, and I think we did that well. The Coasters take a break from league action this weekend as they resume their FA Trophy campaign with a trip to Ramsbottom United on Saturday.